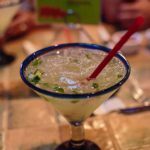 Review: Fiesta En Guadalajara is operated by the same group that owns El Palenque so we had high expectations entering this establishment. The first few sips of our drink had a non-alcoholic juice taste which eventually transformed into a respectable margarita, leading us to believe that the drink was not mixed properly. 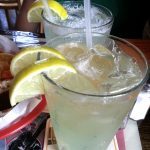 After swirling the straw around in the glass a few times, we were able to get a better feel for this low-sweet mostly lime pronounced margarita. 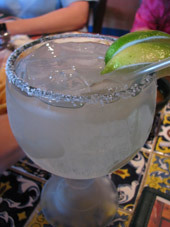 In the end, after the jumbo margarita was consumed, the initial impression and slight unbalance prevented it from rating higher.